Known for its beautiful beaches, miles of shoreline, historical cities, and some of the best vacation spots in America, South Carolina is certainly a great place to go on a honeymoon, start a family, and even retire. But if you’re driving all that gorgeous shoreline, one thing is for sure: it is imperative to have car insurance. Trying to find the best car insurance is difficult — especially when there are so many options available these days. How do you know what car insurance company is best suited for you? What kind of car insurance do you need? With this comprehensive guide, you will learn everything there is to know about choosing the right type of car insurance and which car insurance company to buy from. In this guide, we cover types of insurance coverages, state laws, providers, and more. To start comparing rates in your area today, use our FREE online tool above. If you’re having a hard time understanding the different plans and types of car insurance, don’t feel overwhelmed! You’ve come to the right place. We want you to understand exactly what your plan covers (and what it doesn’t cover). After all, you are paying for it, right? Hold on tight and keep reading to learn all about South Carolina insurance companies, major insurance types, and rates. When you apply for a driver’s license (or renew your license) in the state of South Carolina, you must state either that you are an insured driver, or that you do not own a vehicle. $25,000 for property damage per accident caused by the owner/driver of the insured vehicle. But what does liability coverage mean and what does it cover? Simply put, you are liable or at-fault for any damages that occur because of an accident you caused. These damages include covering the costs of medical bills to anyone who is injured because of the accident, as well as covering the costs of vehicle damages and property damages. If the cost of the damages incurred from the accident is higher than what your insurance covers, you are required to pay for the rest of these damages. Keep in mind that minimum liability insurance does not cover anything that happens to you or your vehicle at the time of the accident if it was caused by you or the person driving your car. Who is covered by minimum liability insurance? Just remember if you’re worried about being held responsible for more than the minimum liability coverage, it might be a good idea to purchase a plan with better insurance. Proof of insurance proves financial responsibility, and by law, South Carolina drivers must be able to prove financial responsibility at all times. Vehicle owners must maintain proof of insurance at all times and must give a copy to any law enforcement officer demanding to see it. If you’re pulled over and caught without proof of insurance on a car you don’t own and you are given a ticket, you must provide proof of insurance within 30 days. If you cannot show proof within 30 days, you may need to pay a $100 reinstatement fee. If you received a ticket for not having insurance on a car you do own, your license and registration will be suspended until the South Carolina DMV receives a $550 uninsured motorist fee and you must prove that you will have insurance for the next three years. The South Carolina DMV will verify your insurance when you register or renew the tags on your vehicle. If your policy is not valid or cannot be found, your license and registration will be suspended and you may need to pay a $400 fee to reinstate your driving privileges. Don’t want to lose your license and have to pay fees left and right? Make sure you keep your proof of insurance on your person and in your vehicle at all times. But wait! There’s more! Sit tight for more info about car insurance premiums in South Carolina. South Carolina’s average disposable per capita annual income is $33,295. Per capita income is the amount of money a person has after paying taxes. If $33,295 is the average annual per capita, this means that the average monthly amount of income is $2772.58. The yearly average amount that residents pay for car insurance in South Carolina is $936.69. That means they are paying a monthly rate of $78.06! The average rate (or amount) for car insurance in America is $974.26, so South Carolina rates are roughly $40 lower than the average. Of course, if you add more coverage to your insurance plan, your rates are sure to go up in price. Below is a table showing South Carolina average car insurance rates by type: liability, collision, comprehensive, and combined. The data above is reliably sourced from the National Association of Insurance Commissioners. Remember, this data was pulled from 2015, and rates may be higher for 2019. Sometimes it’s best to have additional insurance on top of the required insurance for your state in case of a bad accident. Still have no idea what you’re doing? Don’t worry! Next, we will help you understand some additional coverage types, and why they are important. Be aware that these types can be added to any basic car insurance plan. The table above shows that in 2014, about 84 percent of medical bill claims were covered by the person’s insurance company and almost 74 percent of uninsured/underinsured claims were also covered. This is called a loss ratio. Car insurance companies who aren’t covering enough claims may be scamming you out of paying too much towards your yearly premium rate. But, companies who are covering too many claims, run the risk of bankrupting themselves. That being said, car insurance companies who pay about 60-85 percent of claims are good companies to invest in when it comes to making sure your claim will be covered appropriately. The table above shows that South Carolina has good rates for claims being covered. If you are paying $1,200 a year towards your premium, about 84 percent of that money is going towards covering claims — whether you or someone else with your car insurance company has been in an accident. Although these types of additional liability coverage plans are not required in the state of South Carolina, you might decide that adding some extra padding to your plan is a good idea. Approximately 9.4 percent of motorists in South Carolina are uninsured. South Carolina is ranked 37th in the state for uninsured drivers! But what does this frightening fact mean for you? Almost 10 percent of drivers will not be able to pay for damages in accidents that they cause! Most of these accidents caused by uninsured drivers will cause the driver to go bankrupt, leaving you vulnerable to covering the costs of damages yourself. Also, be sure to find a company that doesn’t have super high (over 90 percent) or super low (under 60 percent) loss ratios. We’ve already made it crystal clear that having just the required amount of car insurance isn’t always the smartest idea. But are there any other factors to consider? How do you know what other scenarios your plan should cover? Below is a list of some of the most cost-effective insurance coverage out there. Pay attention! This list is extremely important and will help you save money when an accident occurs. Just like with additional liability coverage, these add-ons can be added separately to your existing policy, or all at once, giving you the option to customize your plan. Did you know that things like your age, gender, and what you do for work, and if you’re married or single can influence your car insurance rate? The proof is in the pudding below! As you can see, the younger you are, the higher the rate you’ll pay. Males are often associated with being reckless drivers, so more than likely they will pay more for car insurance than females do. If you live in a big city, your rate might be higher than someone who lives in the country, or vice versa. See if you can find your zip code and city in the list below. This list below compares car insurance rates based on cities with the highest rates versus cities with the lowest rates. Now that we’ve touched on different types of car insurance, it’s time to start discussing how to find a good car insurance company, and why and how that company will meet your needs in the long run. But sometimes it’s a full-time job just to research all of the different car insurance companies out there, and that’s exactly why we took some of the guesswork out of it for you. Stay tuned as we hit company ratings, complaints, and more. What is an AM Best Rating? According to Insure.com, an AM Best Rating is an independent opinion based on a company’s financial strength and ability to meet its ongoing insurance policy and contract obligations. Here is a complete table of financial ratings for some of the largest companies in the state of South Carolina. As you can see, all of these companies have a pretty good loss ratio. USSA Group is slightly high at 92.18 percent, but overall, none of these companies are at risk of going bankrupt. Take a good look at the data below. 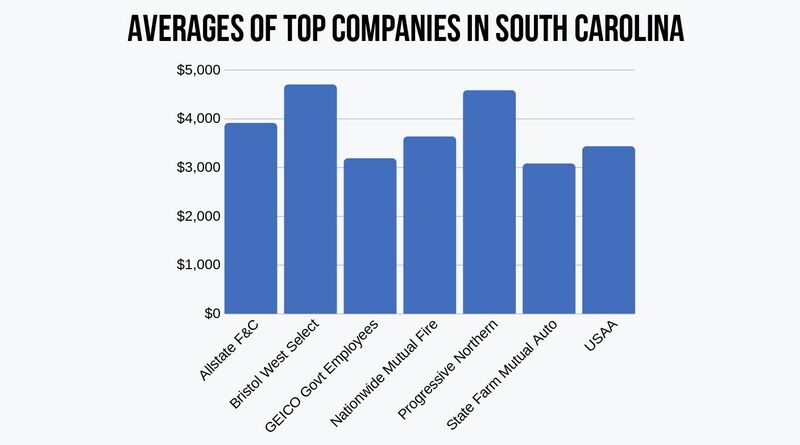 This is a list showing company complaints versus total complaints against the top ten car insurance companies in South Carolina. Remember that there can be invalid complaints. It does not mean a company is a bad company just because it may receive complaints every once in a while. If you take a look at Bristol West Select compared to Geico in the graph below, you can see that Geico is almost $2,000 less than BWS. That’s a huge difference in price! Yikes! For some people, how many miles they drive a day can affect their insurance rate. Most companies add around $100 more per year if you average 25 miles of driving a day. But, Allstate adds just under $200 to their yearly premium. Sometimes it can be tempting to go with a lower annual car insurance premium. But, a better plan with better insurance will protect you in case of an accident or natural disaster. Look at the following table while you consider different coverage prices. By shopping around with different companies, you may be able to get better coverage for just a couple bucks more every year. Take a look at Nationwide for example — the difference between their medium and high coverage rate is $43 a year! Can good or bad credit history affect my car insurance rate? You betcha bottom dollar it can! If you have really bad credit, you are likely going to pay a few thousand dollars more a year for your car insurance premium. If you have great credit, generally you’ll pay less for car insurance. It’s that simple. According to The Balance Magazine, the average credit score for South Carolina residents in 2017 was 657. One other important factor that may impact your insurance rate even more than credit score does is your driving record. As you can see, if you have had a DUI or even one speeding violation, your rates can dramatically increase. But if you’re a clean driver, your rates are likely to be on the lower end of the spectrum. What is the difference between licensed and foreign insurance? South Carolina has its own set of laws that they abide by: these are called domestic laws. Domestic insurance is insurance that is created under South Carolina law. Foreign insurance is created under the laws of any state in America. Have you ever been traveling through an unfamiliar state and gotten pulled over because you didn’t obey a traffic law? Usually, if you’re a good driver, you don’t disregard traffic laws on purpose. However, just because you’re unaware of the state laws doesn’t mean you’re going to get off with just a warning. But what are some of the state driving laws in South Carolina? Keep scrolling to learn more about South Carolina state laws. We’ve already said that South Carolina requires every driver to have car insurance. According to the NAIC, regarding rate filings, filings under 7 percent are file and use, over 7 percent are prior approval. Regarding form filings, prior approval (60-day deemer). File and use filings means that rates must be filed with the state insurance department prior to their use. Prior approval filings are filings that must be filed and approved by the state insurance department before they can be used. South Carolina state law requires everyone to have minimum liability coverage. There is no deductible for windshields for private passenger vehicles if you have comprehensive insurance. So the next time you’re driving down the road and a rock smashes into your windshield and it needs to be replaced, don’t worry — South Carolina state law says that you don’t have to pay to cover the cost of that cracked or broken windshield! Next, we will cover high-risk car insurance and what it means to have high-risk insurance. No one wants to pay a higher car insurance premium, but sometimes, you can’t always get what you want. You can’t always get what you want especially if you have been in a car accident. South Carolina drivers that have been convicted of serious violations, such as a DUI, or who have had their licenses suspended may be required to purchase SR-22 insurance. Scan the list below for a few reasons that you might have to have high-risk insurance. It doesn’t happen all the time, but if you are required to have high-risk insurance, some companies may not want to insure you. If you really, really want low-cost insurance, be a great driver. Avoid car accidents and don’t drink and drive. It’s pretty self-explanatory. There are ways to lower your car insurance rate other than just being a great driver. But wait! There’s ways to save even more! Shopping around, comparing rates, and asking for a price-match with other companies are all great ways to save. Insurance fraud by definition according to the Insurance Information Institute is a deliberate deception perpetrated against or by an insurance company or agent for the purpose of financial gain. Just like every other state in America, insurance fraud is illegal in the state of South Carolina. But how do you commit insurance fraud? Still wondering what not to do when it comes to insurance fraud? Watch this short video about insurance fraud fails. Insurance fraud in South Carolina is considered a felony and can be punishable by jail time. Statute of limitations means that there is a certain amount of time to file a charge against someone or something — or in this case, a claim. If you forget to file a claim or don’t file it within that statute of limitations, you will not receive money from your insurance company. In South Carolina, a person has just three years to file a claim for property damage and/or personal injury. Section 38-59-10 in the South Carolina code of laws says that when an insurer under an insurance policy requires a written proof of loss after the notice of the loss has been given by the insured or beneficiary, the insurer or its representative shall furnish a blank to be used for that purpose. If the forms are not furnished within 20 days after the receipt of the notice, the claimant is considered to have complied with the requirements of the policy as to proof of loss upon submitting within the time fixed in the policy for filing proofs of loss written proof covering the occurrence, character, and extent of the loss for which claim is made. The 20-day period after notice of loss to furnish forms applies to all types of insurance unless a lesser time period is specifically provided by law. Since all drivers are required to have car insurance in South Carolina, there are serious penalties for driving without car insurance. As you can see, if you drive without insurance, you may end up in prison for 30 days without warning! If you do have insurance, (and we hope you do by now) you need to provide proof of insurance at all times. If you fail to surrender your registration and plates to a law enforcement officer and your insurance policy lapses, your license and registration will also be suspended until you show valid proof of insurance and pay a $200 reinstatement fee. To get a learners license in South Carolina, you must be at least 15 years old. Take a look at the table below for more license requirements. Teens in South Carolina with restricted licenses must also follow the requirements listed below. In South Carolina, it doesn’t matter if you’re 19 or 90 when you’re renewing your license — everyone young or old must renew their license every eight years and must show adequate proof of vision at the time of renewal. South Carolina drivers are permitted to renew their license online or through the mail. If you want to drive that beautiful South Carolina shoreline and you just moved from another state to South Carolina, you have to get car South Carolina car insurance. If you want to stay with the same car insurance company that you had in the state you moved from, you can absolutely do that — unless they won’t insure you in South Carolina. Reckless or negligent driving in South Carolina is defined as as driving in a way that shows a willful or wanton disregard for the safety of persons or property. For a first violation, a motorist faces up to 30 days in jail or $25 to $200 in fines. First offense. Motorists convicted of a first reckless driving offense face up to 30 days in jail or $25 to $200 in fines. Repeat offense. In addition to the first-offense penalties (see above), anyone convicted of a second or subsequent reckless driving offense within a five-year period is looking at a three-month license suspension. A reckless driving conviction will also add six demerit points to a motorist’s driving record. Don’t forget that a bad driving record will increase your car insurance rates. Just like we mentioned above, if you don’t know driving laws in the specific state you’re driving in, you are at risk of being pulled over and given a citation. Keep reading to lean more about South Carolina’s rules of the road. South Carolina is an at-fault state. This means that when you cause an accident, you are the one who is responsible for covering the costs of damages and medical bills that resulted from that accident. It is recommended that you purchase more than the minimum amount of insurance required as medical bills and car repair costs can add up very quickly. Don’t be a dummy and drive without a seat belt. It takes two seconds to pull that buckle across your chest and the reward for doing so could be saving your life. South Carolina wants your child to be safe, so pay attention to these car sear laws and don’t put your child in harm’s way. Will insurance cover me if I am riding in the bed of a pick-up truck at the time of an accident? South Carolina state law says keep right if you want to drive slower than the traffic around you. Basically, if you want to drive slow or you need to drive slow, just stay in the right lane. The state law also says to reduce your speed and to vacate the lane closest to stationary emergency vehicles. Remember to be cautious of workers on the side of the road and you should not have a problem following this law. Usually, if you’re going to get a ticket, it’s going to be a speeding ticket. Look at the box below to learn about South Carolina speed limit laws. If you are interested in getting a job driving for ridesharing companies like Uber or Lyft, you’ll need to have ridesharing insurance to protect you in case of an accident. Geico is one car insurance company who provides ridesharing insurance. Right now, there aren’t any laws against managing automated vehicles in the state of South Carolina. Every state has their own set of safety laws. Keep reading to find out what the safety laws are the South Carolina. In 2018, South Carolina was ranked 2nd in the nation for drunk driving fatalities. SafeWise reports that there were 7.98 drunk driving related deaths per 100,000 people in 2018. Criminal Status 1st misdemeanor, 2nd in 10 years class C misdemeanor, 3rd in 10 years class A misdemeanor, 4th+ in 10 years class F felonies. Because of this data, South Carolina has strict laws against drunk driving. Don’t drink and drive. Doing so could cost you your license, jail time, money, your own life or someone else’s. Currently, there are no laws against doing marijuana while driving. However, that doesn’t mean you can’t be held responsible for driving under the influence of marijuana. The state of South Carolina can charge you for impaired driving which could lead to fines, jail time and more. Sometimes, texting or talking on your cell phone while driving can be worse than drunk driving. While it’s not illegal to talk on the phone while driving, it is illegal to text while driving. If a police officer suspects that you are texting while driving, he or she has every right to pull you over. We’ve covered state driving laws in depth, but now it’s time to jump into some of the most-known driving facts in South Carolina. Similar to other states, South Carolina has unique driving risks. Knowing these risks will help keep you protected while driving along those gorgeous Carolina shorelines. Up next we will cover everything you need to know about car theft, EMS response time, and more. Obviously, certain cars are more valuable than others, so some cars are more likely to be stolen than others. If your car is stolen, your insurance may cover the cost to replace it. Below is a list of the top-10 most stolen cars in South Carolina. According to this list, Ford pickups are the most stolen car in South Carolina. But did you know that where you live can affect whether or not your car is at risk of being stolen? Scan this list from the FBI to see how many thefts happened in your city in 2013. Now that we’ve discussed car theft, let’s move on to more dangers on the road in South Carolina. In 2017, there were 988 traffic fatalities in South Carolina. Some of those fatalities were caused by inclement weather. Traffic fatality rates in rural areas are significantly higher than they are in urban areas. Road type may be a major cause in accidents, however, vehicle type can also be a major cause. If you check the list below, you’ll see that speeding results in many accidents, especially in accidents involving fatalities. Up next, we have a list of the top-10 counties in South Carolina with the most fatalities. Alcohol-impaired drivers are another major cause of fatalities in crashes. Teenage driving fatalities aren’t uncommon because inexperienced drivers tend to have accidents more often. But what is even more depressing is the number of teenage fatalities caused by drinking and driving. EMS response time can sometimes mean the difference between life and death. It makes sense that there is a faster response time in urban areas compared to rural areas. Have you ever wondered how many cars your neighbors own? The average number of cars owned in South Carolina per household is two. South Carolina’s car ownership average is illustrated in gray and the U.S. average is illustrated in orange. Charleston, South Carolina is one of the worst cities in the United States for traffic congestion. According to TomTom, you should give yourself an extra 29 minutes a day if you’re traveling to or from Charleston. At 29 minutes a day, that’s over 100 hours a year! In this post, we’ve covered types of car insurance, car insurance rates, and South Carolina driving laws. Now that you have all the information you need to purchase car insurance, start comparing rates for yourself and your family and find the best plan out there to fit your specific needs. Enter your zip code below to get started today!